Posted on Fri, May 21, 2010 : 8:59 a.m.
A tobacco executive previously tied to activist investing has been named chairman of Ann Arbor-based Borders Group Inc. after he pumped $25 million into the book store chain, officials announced this morning. Bennett LeBow, chairman of tobacco holding company Vector Group Ltd., was elected chairman of Borders, and previous chairman Richard "Mick" McGuire resigned. LeBow personally purchased 11.1 million shares of Borders' common stock at $2.25 a share. The stock (NYSE: BGP) closed at $2.23 yesterday. Borders headquarters on Phoenix Drive in Ann Arbor. It was not immediately clear whether LeBow, now the largest individual shareholder of Borders stock, would make specific demands or has a defined vision for the beleaguered chain. The deal could signal a new direction for the company, which has been struggling to reverse a continuous revenue slide in recent years. The Wall Street Journal said the deal gives LeBow some 15 percent of the company's outstanding shares. Borders said in a press release that LeBow's investment would further shore up the company's finances. LeBow, who has previously teamed up with activist investor Carl Icahn, is a tobacco industry veteran whose company controls cigarette maker Liggett Group. Vector Group's CEO, Howard Lorber, also joined Borders' board as a result of the investment. A spokesman for LeBow said he preferred not to comment about the announcement. Borders declined to make Edwards available for an interview. "If the issuance of the warrant and warrant shares is not approved by the company’s shareholders, the company will be obligated to issue to Mr. LeBow 35.1 million stock appreciation rights," Borders said. "Upon the exercise of the stock appreciation rights, Borders Group would be required to make a cash payment with respect to each right equal to the excess, if any, of the future market price of the company’s common stock over the $2.25 base price provided in the stock appreciation rights." The investment comes less than two months after Borders dodged a financial bullet by refinancing its revolving credit facility and paying off a $42.5 million term loan to investor Bill Ackmann of New York hedge fund Pershing Square Capital Management, Borders' largest individual shareholder until this deal.. Borders said today that Pershing "has indicated its support for the (LeBow) transaction." The deal triggers an existing agreement that allows Pershing to receive 2.7 million warrants for Borders stock exercisable at a price of $0.65 a share. Also, after LeBow receives the additional 35.1 million shares, Pershing will receive another 8.6 million warrants at the price of $0.65 a share. 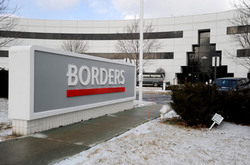 Borders employs about 650 workers at its headquarters on Ann Arbor's Phoenix Drive. The firm's same-store sales in the fourth quarter of 2009 dropped 14 percent as the company’s annual loss dropped from $186.7 million in 2008 to $109.4 million in 2009. Fri, May 21, 2010 : 10 p.m. I wonder if Ackmann/Pershing Square retains their 17% holding of Border's common, or did they just pass the hot potato to Lebow/Vector, in effect. The article doesn't really say, one way or the other. Unless Mr. Lebow is some kind of magician, the solution(s) to Border's fundamental business problems may well remain elusive. Perhaps some aspects of this deal haven't been made public. Fri, May 21, 2010 : 8 p.m.
Fri, May 21, 2010 : 7:02 p.m.
Obviously this means that Borders is going to start selling cigarettes. Or maybe they'll just try to help pipes make a comeback. Fri, May 21, 2010 : 6:48 p.m.
Have tried to buy books from Border's online, they are always about 10% higher than Amazon or Barnes and Noble. This guy just invested and is going to lose his 25 million bucks. A sucker is born every day! Sad that Border's is going bye bye and I mean it. Ann Arbor cannot afford more jobs lost! Fri, May 21, 2010 : 11:59 a.m.
@braggslaw...you are correct abour Borders complete failure with it's.com business...twice! But, you also underline another problem that Borders brick &amp; mortar store has had for many years. "I love reading the books "in" brick and mortar stores..." Borders and other bookstores do not make any money off people who read the books in the store but don't buy the books. That is why we have libraries! Fri, May 21, 2010 : 9:59 a.m. There is a place for brick and mortar bookstores, but Borders has failed in the online market and needs to formulate a new business case to address floorspace, e-readers etc. I lovereading the books in brick and mortar stores(I can thinkg of only a few other things I would rather touch) but they are a huge capital and inventory investment that must be offset by other revenue flows. I hope Borders figures it out, I would hate to see them go under.